Ratuki is a newly acquired addition to the Hasbro card game line. Though the game was first released by USA-Opoly in 2009, it made its way into Hasbro’s lineup in 2010. 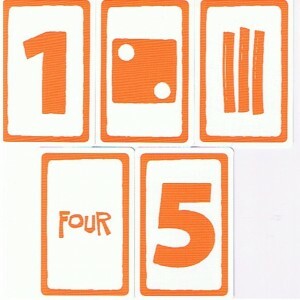 A simple, fast paced card game with elements similar to Uno and Slap-Jack, it pits two to five players against each other as they try to collect stacks of cards arranged sequentially from one to five. 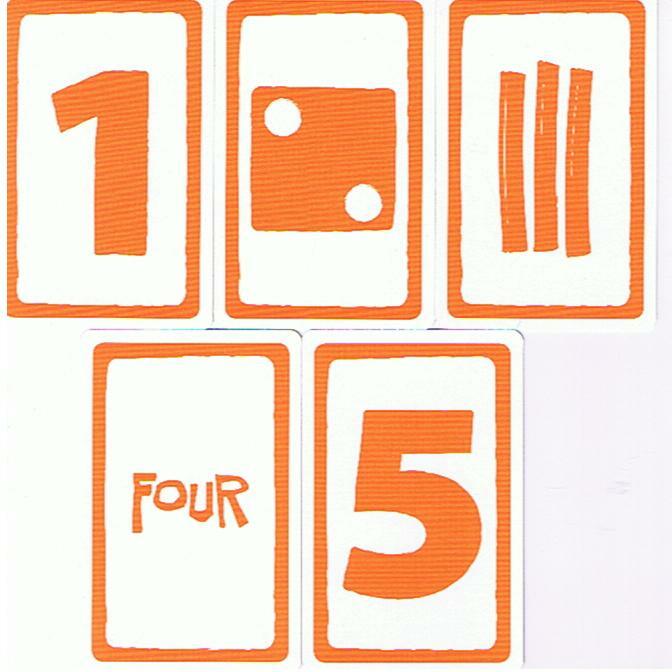 To add a twist, the Ratuki game cards do not only display numerals: they also depict dice, tally marks, printed words, and wild cards. Players play simultaneously with their own deck of cards. Whenever a player plays a five on top of a stack of cards, they yell “Ratuki!” and get to keep that stack of cards, which is counted toward the 100 point goal. Recommended is recommended for ages eight and up and accommodates two to five players, with an average play time of 15 minutes. The pace should be quick enough for even the youngest players, with enough variation to keep older players entertained through a few games. I haven’t had an opportunity to get my copy to the table yet, but I can tell from the rules that it will be an excellent game for mixed-age events like Thanksgiving and Christmas, and it may even become a new family staple like Uno. It might be a bit difficult to get used to reading the mixture of symbols and numbers, but over time, you and your play-group should get the hang of it. When I purchased the game at Walmart in January 2011, the shelf price was $6.99, not a bad price for a new game. Shop around, and you should still be able to pick it up below MSRP. 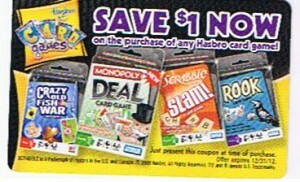 While the Ratuki promo has expired, Hasbro is still running the $1.00 off promotional coupons inside the boxes of their card game line(Scrabble Slam, Monopoly Deal, etc.) Look for specially marked boxes that say “1.00 off Coupon Inside” and have a large yellow indicator on the front of the box. You can use the $1.00 off promo coupons on Ratuki, or any other Hasbro card game.